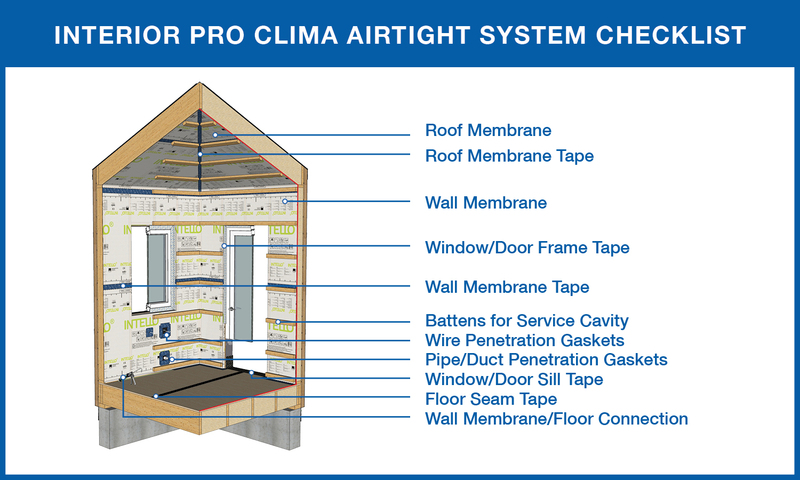 The INTELLO membrane, manufactured by Pro Clima of Schwetzingen Germany, is the state-of-the-art interior vapor control and air-tightness membrane for cold and mixed climates. 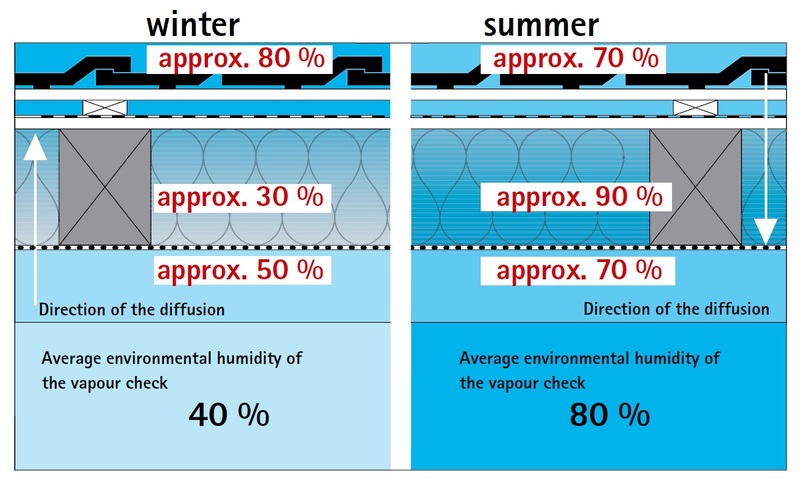 It is an intelligent membrane that changes permeability in a range from <0.13 perms in winter to 13.2 perms in summer depending on the relative humidity of the air around it. This intelligent range of permeability gives assemblies maximum protection against moisture damage. When Code requires a Class II vapor retarder: INTELLO provides an interior Class II vapor retarder and interior airtight layer. When assemblies have significant vapor retarding or vapor closed outboard layers: In assemblies that have limited outward drying potential, like vapor closed roofs (flat or asphalt shingles), foam insulation boards or exterior sheathing (OSB, plywood), INTELLO provides inward drying capability. When retrofitting a Historic Masonry building with interior insulation: INTELLO helps address concerns about moisture levels of brickwork and freeze-thaw damage, while providing a verifiable and repairable airtight layer. When installing batt insulation: INTELLO provides airtightness, eliminates worries of convective currents, and manages moisture in all seasons to avoid vapor condensation problems. 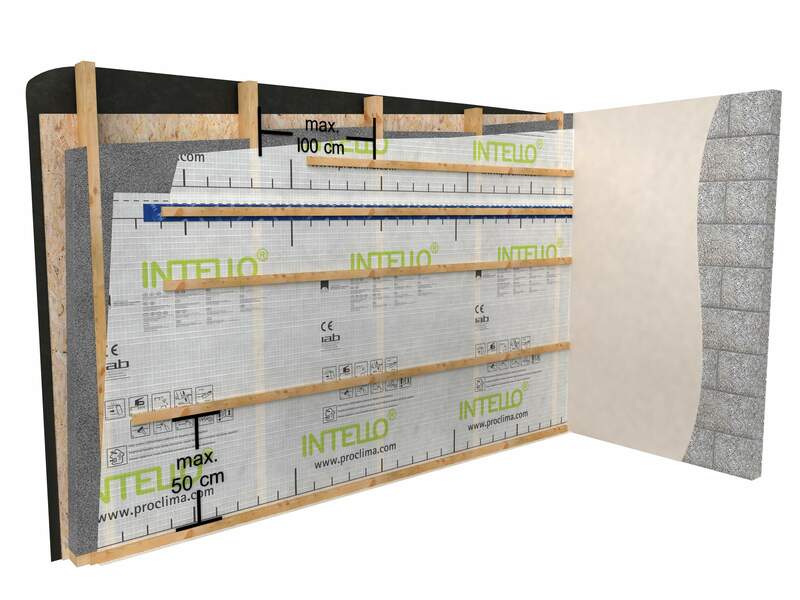 When interior airtightness is desired: INTELLO provides a continuous, visibly verifiable, and repairable interior airtight membrane in addition to vapor control. Similar to natural materials like wood, INTELLO changes its vapor permeability in response to the relative humidity of the surrounding air. The membrane becomes more vapor open when exposed to higher relative humidities and more vapor closed in drier conditions. The engineered membrane achieves a range of permeability and safety not possible with other vapor-retarders, -barriers or other materials. In winter, when the cold temperatures prevent much moisture from being held in the air, the membrane reduces its permeability to <0.13 perms. This prevents any moisture from the warmer, more humid indoor air from entering the wall assembly. In summer, the warm outdoor air carries a lot of moisture, raising the relative humidity on all sides of the membrane. The membrane increases its permeability to >13 perms to allow moisture from the warmer, more humid air inside the wall cavity to move into the interior of the building. This prevents any condensation on the inside of the walls. The increase in permeability is triggered when the air moisture content rises above dangerous thresholds of approximately 70-80%. 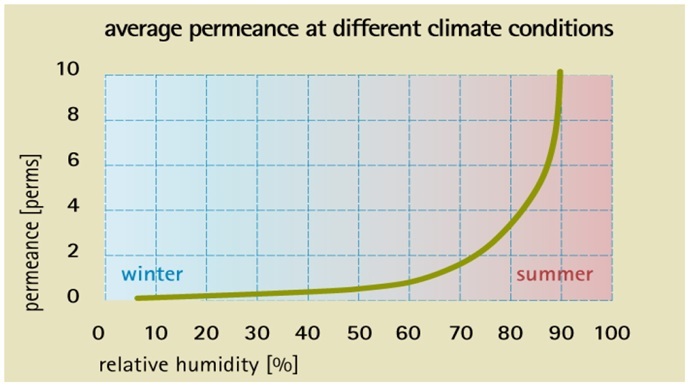 Chart of Average Humidities: This chart illustrates the average humidity ranges in winter and summer around the membrane. Comparing the left hand chart on average humidities to the right hand chart showing the vapor permeability curve, we can see how INTELLO reacts as humidity reaches dangerous levels - opening up radically to allow drying inward. The membrane is not directional, so as it becomes more vapor permeable due to rising relative humidity around it the vapor will move through it in the direction of lower vapor pressure. Consequently, INTELLO is not suitable as an interior membrane in consistently high-humidity occupancies like indoor swimming pools. With this ability to allow for inward drying, INTELLO can provide safety in even the most demanding circumstances. Below is a graph from an extensive Pro Clima study showing the relative drying ability of various vapor retarders. 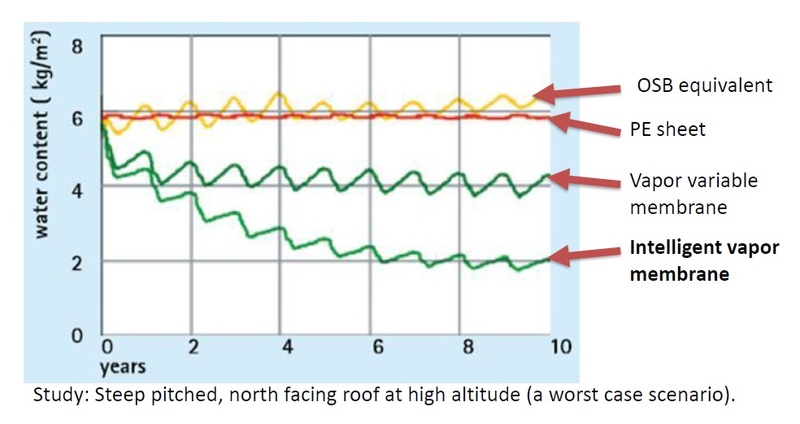 This demonstrates the performance of different air barriers in one of the worst-case scenarios, where you have a north facing pitched roof at high altitude and a construction loaded with moisture at the outset - as construction often can be. The assembly starts with 6 kg/m2 water content after construction. Where the inboard OSB and plastic sheets are causing moisture problems, keeping the initial moisture load of the assembly constant, the intelligent vapor membrane, INTELLO, is driving down the moisture content to safe levels. For more on this, read our post: Why The Vapor Curve Matters. INTELLO is the flagship material in a complete system of air sealing and vapor control that includes tapes, adhesive caulking, and gaskets - giving you robust and long lasting airtightness. INTELLO Plus, with blown cellulose behind, 2x's as counter battens support membrane, allow sheetrock to be mounted and services (electric etc). to be run on interior of airtight layer. If you are using dense-pack insulation, cross battens are required to ensure even distribution of pressures. Ideally, the cross-battens provide a service cavity for running wiring and plumbing and thereby limit the number of penetrations in the air- and vapor-control layer. We have a sample 3-part architectural construction specification for use and editing.